One ton of portland cement produces a ton of CO2 emissions; can alternatives reduce that by 97 percent? This summer, if you’re thinking of mixing two parts of pozzalona with one-part lime and water as a tropical drink to serve to your guests, it will surely make their their throats go dry…really dry: these are the ingredients the Romans used for their cement; volcanic ash (pozzalona) was an excellent binder that still holds their ancient temples, columns and aquaducts in place. For sure, one of the fixings that bound the Roman Empire together during its reign from 509 BC to 476 AD was, in fact, cement. Not the kind we use today, of course, as Portland cement didn’t surface until about two hundred years ago in the mid-1800s. Portland cement costs little to produce, even with the added expense of mining for the lime; thus, it remains the backbone of structures worldwide. 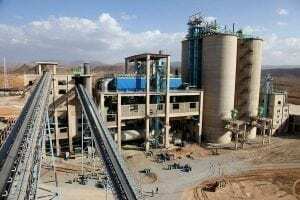 One ton of cement production produces a ton of CO2 emissions, and with 5 to 7 percent of the world’s carbon emissions emanating from the production of cement itself, what’s a Green-nik to do? Since the structures themselves aren’t the carbon-emitting culprits, the focus turns to the fossil fuels used in the coal-fired power plants (40 percent) as well as the chemical stages to produce it (50 percent). For example, the typical power plant will capture one of the byproducts of its coal-burning system—fly ash—and store it as “coal ash” in ponds, ship it to landfills or sell it to the building industry for the production of gypsum (wallboard) or cement. Overall, the industrial processes here in the U.S. adds about 14 percent of the total CO2 emissions. So, it’s hardly worth mentioning, but by today’s standards, the realm of Roman engineering filled chariots full of pozzalona-based cement without adding to the world’s carbon emissions of the time for a finished product deemed more durable than Portland cement. And so it came to pass, that, over time, whenever you are mixing cement with ash that mimics some of the same mineral traits as volcanic ash—regardless of where it came from in the world— then it is deemed to be pozzalan. What’s more, a pozzolana-like substitute can be created using fly ash plus a water-quenched boiler slag to mimic its durability both in and out of the water. It took decades for international researchers to finally unlock the secret behind pozzalono-lime and it’s reaction to saltwater: they studied undersea columns in numerous Roman harbors in the Mediterranean. Now, they understand why these under-water columns and piers can withstand the rigors of thousands of years in the salty brine. Comparatively, portland-based cement may see 50 years or less of life in seawater before erosion sets in. Over the coming years, structural engineers may be turned on to the possibilities these findings bring. Recognizing the “green” qualities of Roman concrete puts the focus, for one, on the process of making portland cement. Worldwide, according to Columbia University’s Earth Institute blog, the production of cement is projected to reach around four-and-a-half billion tons by 2050—China alone uses 1.5 gigatons of cement annually, enough to build 2,000 Pentagons. Emissions? By relying less on fossil fuels to heat the kilns that produce the cement, a reduction in cement emissions could exceed 18 percent by 2050. Furthermore, by using a “blended cement,” the reductions could be as much as 20 percent. Unfortunately, this alternative has a very big red flag attached to it: substitutes for limestone, for example, consists of a lot of heavy metals. Theoretically, by using “green” cement produced by the Drexel method, CO2 emissions worldwide could be curbed in three years.